The earth is decimated and civilization is split into two groups: rich folks in the sky-cities and poor folks on the planet’s surface. The dichotomy is reminiscent of Susan Collins’s Hunger Games. Let’s get the remaining similarities out of the way before moving on. The poor rarely have the opportunity to see the sky cities first hand, but they are practically forced to watch the unfair juxtaposition through government mandated television. They also have sky-born civil servants posted to their districts as well as security forces to maintain the totalitarian rule. And of course, the main character is a random clever girl from the wrong side of wealth, plucked from obscurity. Throw in a rocky home life and a younger sibling for the main character to cherish, and you might say you’ve found yourself a Katniss copy. 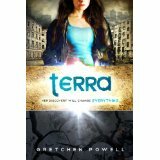 Terra is the story of a land-bound girl doing her very best to forge a life for herself and her brother, Mica, in the shattered wasteland of earth, dodging acid rain and surviving off of canned chemical compound dinners. She is a scavenger, foraging outside of the city walls for spare parts dropped from above to take to the recycling plant for pay day. The book unfolds in 3 acts. The first: Terra finds trouble while scavenging far outside the city limits. She meets a young man named Adam who saves her life. They get to know each other a little bit. The second: Adam follows Terra back to the city. They get to know each other better. We learn more about how civilization works in this dystopian future. The story progresses. The third: Well, I don’t want to spoil it, but there’s a pretty neat twist that makes this book decidedly un-Hunger Games-y.